The New York Times on Tuesday published in an in-depth investigation into a series of financial transactions by Fred Trump, President Donald Trump’s father, to pass wealth to his children. Legal experts said investigators would not be able to look into most of the allegations in the story because of the statute of limitations on estate and gift tax audits. But they said there was one avenue investigators could follow: whether the Trump family omitted or misrepresented gifts on Fred Trump’s estate tax return. Even if investigators were to look into that, it is unlikely anything would come of it, the experts said. “The Tax Department is reviewing the allegations in the NYT article and is vigorously pursuing all appropriate avenues of investigation,” a representative told Business Insider in an email. But given The Times’ findings of a complex series of transfers and the companies the Trump family created to facilitate them, what could investigators really do? According to experts in tax law, investigators for New York state and the IRS have little recourse for many of the allegations in the Times report. But one avenue could open up Trump to possible penalties. The experts cautioned, however, that while there might be some legal recourse available, it’s unlikely that any investigation would yield significant consequences. Many of the practices detailed in the Times report, such as aggressively undervaluing properties on tax forms, would not open up Trump or his family to an investigation, because the IRS and New York state tax officials have already had a chance to review them via an audit. 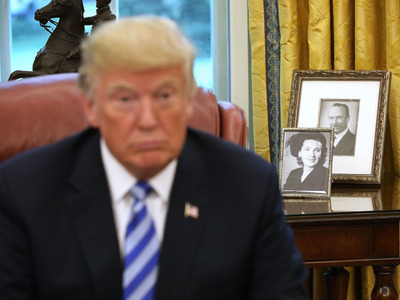 Chip Somodevilla/Getty ImagesFramed photos of Donald Trump’s parents, Fred and Mary Trump, on a table in the Oval Office. There is a three-year statute of limitations on federal and New York state estate and gift tax audits. The estate of the president’s parents, Fred and Mary Trump, was audited in 2000, and various gift tax returns were audited in the 1990s, so officials could not reopen those cases. But in some circumstances, the statute of limitations may not apply, said Beth Kaufman, a member of the law firm Caplin & Drysdale who has experience in estate planning. “For many of the federal tax issues, the question would be whether the government could prove fraud, because there is no statute of limitations that applies if there is fraud,” Kaufman told Business Insider via email. Similarly, any intentional misstatements or omissions from an estate or gift tax return would mean New York never had a “bite at the apple,” Glass said, which would allow investigators to assess possible civil penalties. The transactions that could be open to scrutiny include a series of loans to Donald Trump from Fred Trump that The Times said were never repaid or were considered repaid after Fred Trump made a deal to take a position in his son’s properties. “The loans from Fred to Donald that were later deemed paid when Fred took an interest in one of Donald’s entities, which he later sold back to Donald at a bargain price – this series of transactions raises significant gift tax issues,” Kaufman said. Glass said it would depend on how those loans were reported on Fred Trump’s estate tax return. If there was no repayment or interest charged, the loans should have been considered gifts and been subject to higher gift taxes. In turn, those gifts should have been disclosed on his estate tax return. The Times reported that Fred Trump was given an ownership stake worth $US15.5 million in Donald’s Trump Palace development, mostly in exchange for the elder Trump’s forgiveness of loans to his son. But according to The Times, Fred Trump sold his stake four years later for just $US10,000, most likely back to his son. In legal terms, that would amount to a $US15.4 million gift subject to a 55% gift tax rate. Fred Trump never reported such a gift, according to The Times. If it was also left off his estate tax return, that could open up Donald Trump, an executor of the estate, to an investigation. Experts said they thought that if investigators were to determine a possible avenue to pursue penalties against Donald Trump and his family, the IRS wouldn’t lead it. But they said New York could step in and look at the Trump family’s returns. Federal and state authorities in New York have spearheaded investigations into a variety of Trump’s business entities, most notably the Trump Organisation. And the New York State Department of Taxation and Finance already has an open investigation into the Trump Foundation, the president’s nonprofit. But the likelihood of any meaningful penalties from an investigation, if one is pursued, is slim. “In such an old case, this would be a high bar for the government to overcome,” Kaufman said.